Shirley Jelinek Jones, 93, went to be with her Lord and Savior Jesus on Monday, April 1, 2019. Shirley was born to Clara & Walter Jelinek on Aug. 8, 1925 in Milwaukee, Wisconsin. On Oct. 15, 1946, Shirley married Ray Jones and headed to Texas where they remained married for 63 years. They raised three boys in Lake Jackson – Jeff, David, & Scott. Shirley also claimed her stepdaughter, Alleene Groves, as her own. 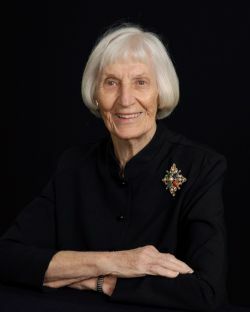 She worked for Dr. W. D. Nicholson for over 25 years. In 1976, Shirley & Ray retired to the hills surrounding Fredericksburg, Texas where they enjoyed 34 years of retirement together. Shirley moved back to Lake Jackson in 2011 after Ray’s death to be close to her family. Shirley was a faithful servant to the Lord in that she taught Sunday School & Vacation Bible School for over 50 years. She was a great prayer warrior too. She loved to garden and spent many happy days with her flowers & fruit trees. She never met a stranger and enjoyed talking to anybody about anything. She was preceded in death by her parents, Clara & Walter Jelinek, her husband Ray, a sister Beverly Fechtmeyer, and her brother Clyde Jelinek. She is survived by her sister Lucille Anderson of Ft. Collins, Co; three sons - Jeff Jones (Caryn) of Buffalo, Texas; David Jones (Robin) of Clute, Texas; Scott Jones (CJ) of Lake Jackson, Texas; a stepdaughter- Alleene Groves (Don) of Georgetown, Texas; her grandchildren – Jennifer Stafford, Lindsey Neyland, Lauren Brittain, Josh Jones, Beth Clark, Nik Jones, Douglas Groves, Marilyn Harren, & LeeAnn Groves; and 16 great grandchildren. A memorial service will be held at First Baptist Church Lake Jackson on Sunday, April 7, 2019 at 2 PM. A reception for all will be held after the service. In lieu of flowers, the family is asking that donations be made to First Baptist Church Lake Jackson – Children’s Ministry.